Anita received her massage training at the Center for Natural Wellness School in 2006. She is a professional member of the American Massage Therapy Association. She enjoys taking advanced training courses to achieve a higher knowledge to bring to her clients. She holds certifications in CORE Myofascial Therapy & CORE Sport Bodywork as well as a Certified Kinesio Taping Practioner. She likes to customize each session to the client’s needs. Rarely are two sessions exactly the same. She offers sessions in Swedish relaxation, deep tissue, hot stone therapy, sports massage, orthopedic massage, lymphatic facilitation, Active Isolated Stretching, Kinesio Taping and pregnancy massage. 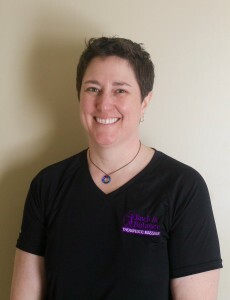 Anita actively participates at numerous sporting events including Ironman USA Triathlon Lake Placid where she is part of the IronHands Massage Team. Whether she is traveling to work with professional athletes, weekend warriors or the everyday athlete, she will listen to their needs and work towards achieving client’s needs.